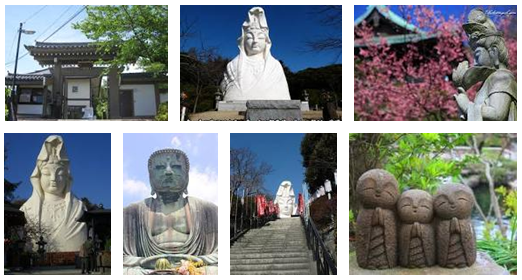 Guide and information of Japan travel, with Kamakura Giant Big Buddha, Daibutsu, Kannon Bosatsu. Byakurengedo in Shinjuku. New generation, new age, new style of life&death. Tokyo has 1,398 shrines, and surrounding towns have big buddha statue (similar to the one in Nara, some actually bigger). Taito-ku has this style of Goshuin. Regardless having been to Dharamsala, Xia-He (for Labrang Temple) or not, it is worth checking the sites. Easy to make it in one-day-trip from Asakusa. Ushiku has one of the world tallest buddha statue. This page has its spec. Nearby JR station is called Ushiku (52.8km from Ueno station). It is NOT Hitachi-no-Ushiku but simply Ushiku station on JR Joban Line. Scheduled bus will take you right to the statue within 30 - 35 minutes from the station. Kamakura cannot be missed while you are in Tokyo. It is 51.0km south-west of Tokyo central station. Platform at Tokyo station is the same one for Narita Airport (Kamakura is opposite direction though). You may enjoy Yokohama and/or Enoshima with Kamakura to make it full day trip out of downtown Tokyo. Kamakura temple town itself could be an alternative for Kyoto if you did not have time/money to travel to the old capital city. By the way, Kamakura had ruled Samurai Japan from 1192 to 1333 (called Kamakura Jidai). Oofuna Kan-non (next to Kamakura) can be caught on your eyes from the JR train, it will be on your right window when you are riding the train from Tokyo to Kamakura. JR Oofuna (or Ofuna with long O vowel sound) is one of the junction stations where Tokaido Line, Negishi Line, Yokosuka Line and Shonan Monorail turn in and turn out. Nokogiriyama Nihonji is located about 100km south-east of Tokyo. Hamakanaya station is on JR Uchibo Line, 107.0km away from Tokyo central station. Please note that all the Limited Express (Tokkyu) on the Uchibo Line departs from the platform of KEIYO Line (not from SOBU Line platform). You may take Rope-Way to the temple since it is located in a mountain top. Yougoudou at Sensouji Temple in Asakusa. 24 hours to pray. And next to the building has the oldest wooden building in Tokyo (15??). Ooya or Oya or Ohya Kannon is located between Nikko and Utsunomiya, there are several easy access from Ueno (JR) and Asakusa (Tobu). Their official site is here. Are you interested in architect, Kuma Kengo san? Beautiful JR station Hoshakuji and more can be a good one day tour in Utsunomiya area (where the stone is produced). And you will be happily surprise that Asakusa is related because of Asakusa Bunka Kanko Center .